What is involved in visual fiber optic inspection and testing? How is optical power like voltage iin electrical systems? What is "loss" and what are the different ways it can be measured? What can OTDR testing tell you? What role does testing have in restoration? 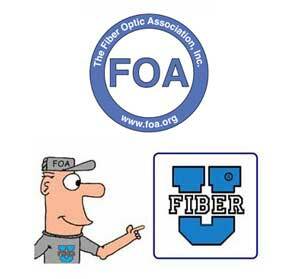 What is the role of standards in fiber optic testing? Fiber optic testing includes testing of various components (fiber, connectors, PON splitters, etc. ), subsystems (patch cords, cable plants, factory prefab cable assemblies) and systems (complete communications systems.) Components are usually tested in labs during the development phase or factories when manufactured. Many if not most fiber optic techs are more concerned with testing cabling systems as they install them or are troubleshooting problems. In this course, we will spend more time on installation testing with some side trips on component testing for those interested in that aspect of fiber optic testing. In order to test installed cable plants, we use visual tests (microscope inspection, visual tracing and fault location), optical power and loss tests (optical power and insertion loss), OTDR or backscatter tests (length, loss, troubleshooting) and more complex tests for special applications. Methods used for testing various components or systems like outside plant and premises networks will vary, so we'll try to explain the differences. It's always best to start with an overview. In this first lesson we will view a video and and read a section of the Online Guide that give you an introduction to fiber optic testing and the instruments before we go into more detail. And a word about standards: Most fiber optic standards cover some aspect of testing; the rest generally cover component specifications or usage that depend on testing to verify those specifications or performance parameters. It's important to understand the intent of standards as well as the content, although neither may be obvious. Component standards are generally written for future systems, goals for manufacturers to aim for when creating new products, but they sometimes forget about the installed base. FOA has been working on creating test standards that are more easily understood and applied and we'll cover those too. Each lesson plan in the course leads you to read online or printed materials (with an emphasis on the online using the FOA Guide), watch FOA YouTube Videos, complete some activities and take the quizzes. Each lesson plan will be self-contained. Lesson plans open in new pages so the course overview page stays open to lead you to the next lesson or you may use the link at the bottom of the page. In this lesson, the video gives an overview and the Online Reference provides more detail.